This isolated spot on the canal next to the Cloud House is one of the best areas in the District of Columbia for fishing. Each spring, shad and herring runs crowd the river--and Fletcher's is overrun with fishermen. At other times of the year, however, the site is easy to enjoy. In 1998, archeologists discovered eight underground silos near the site of Fletcher's Boat House that were built about 2,000 years ago by native American Indians. Similar holes have been found on the East Coast of the U.S., but these are older. Archaeologists believe that the residents of the site may be related to the Algonquian Indians found by Captain John Smith in 1608. The silos were discovered by the National Park Service during planning for a new bridge over the C&O Canal that can be used by cars, bicycles, and pedestrians. Currently, only a narrow tunnel carries auto traffic under the canal. 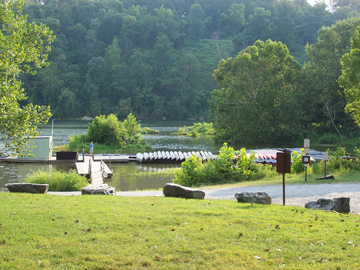 Fletcher's offers rowboat rentals for the Potomac; canoes for use on the canal; and bike rentals for the canal towpath. Live bait and tackle are available for fishermen. The area is extremely popular for the shad runs in spring, and for rockfish in summer, although the Potomac's currents make fishing very tricky. On the shoreline, picnic tables, refreshments, and restrooms are provided. The Fletcher family operated the boat house for four generations, but in 2004, management of the site was taken over by Guest Services Incorporated. Access to Fletcher's Boat House is from Canal Road at the intersection with Reservoir Road.